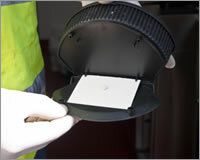 Following a survey of the premises, rodent control points will be established both internally and externally in all appropriate areas, using the most advanced anticoagulant rodenticides available. 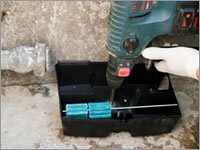 These are generally used around the perimeter of buildings, where they are fixed in position. These are appropriately positioned throughout the internal environment of the building. 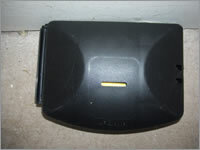 In situations where rodent traps need to be used, these will be placed within tamper-resistant bait stations, to provide extra security and safety. For customer reference and quality assurance. 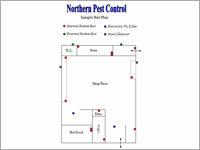 This is held within the customer pest control report file to show the locations of all control points. 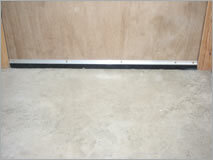 These are attached to the walls of the building to identify the position of the control points, relative to the details on the bait plan held within the customer report file. 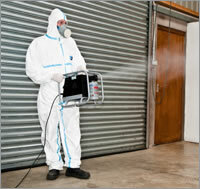 If, after careful monitoring, an insect infestation has been found we will use only the most recent high performance insecticides. 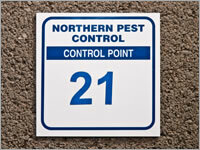 These insecticides combine excellent efficacy with exceptional residual control and low mammalian toxicity. 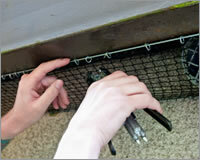 Monitoring Systems – Our monitoring systems contain either a pheromone or food attractant. 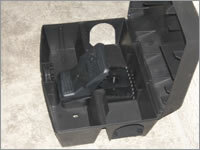 Can be used by itself or clipped to the underside of the tamper-proof mouse bait box. 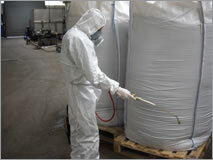 Insecticide Application – Methods include surface spraying, dusts, ULV space treatment and insect baits. 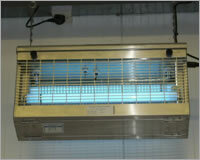 We supply and maintain all types of EFK’s, to include the traditional units with an electric killing grid and the more recent glueboard units, which are of particular use in sensitive areas where ‘exploding’ insects might cause contamination. 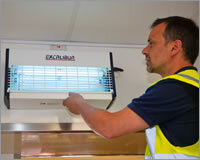 Maintenance of the units can be covered either as a one-off or included as part of the pest control service contract. 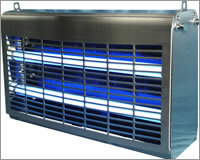 A full range of sizes and types are available to suit any environment or budget. 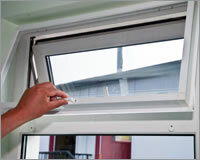 Units are available in enamel white or stainless steel (to include splash-proof units for those extra harsh environments) and most can be either wall-mounted or suspended. 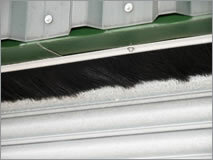 Various methods can be used to prevent birds from entering or roosting on buildings. 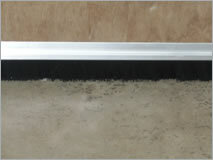 Used on ledges, parapets, signs, beams, pipes, gutters, roof ridges etc. 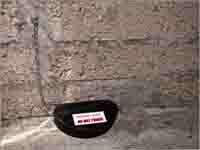 where the spike system acts as a deterrent. 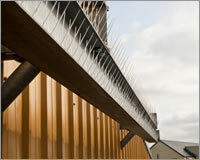 This is one of the most popular methods used for protecting structures from any species of pest urban birds. 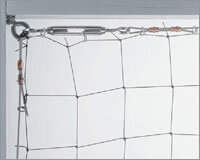 The net is attached to straining wires by the use of hog rings. 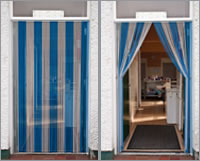 The fitting of brush strip along the top of roller doors, and PVC strip curtains at the entrance will prevent the entry of birds. 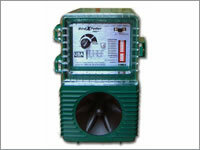 This unit expels and deters birds by broadcasting a variety of naturally recorded bird distress signals and predator calls to frighten and confuse the birds. 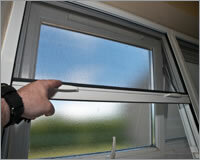 Fly screens allow doors and windows to be open for air flow yet prevent the entry of flying insects. 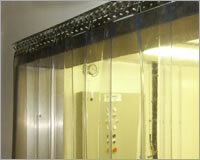 We manufacture supply and fit all types of fly screens to both commercial and domestic premises. 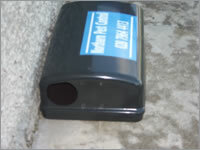 Discrete, and therefore particularly suited to domestic premises. Available in both white and brown. 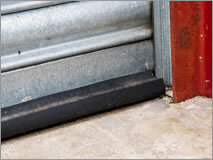 Particularly suited to the commercial market. Available in white, brown and silver. Available in white, brown and silver. 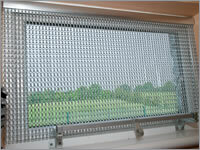 These can be fitted to open doors and windows when the traditional flyscreen mesh is not a feasible option. 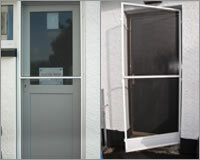 The chains on the door can be tied back to ease access for deliveries etc. 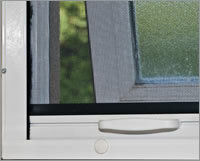 Available in virtually any colour. 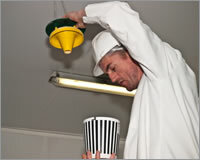 Our inspection reports include recommendation sections on housekeeping and building pest proofing. 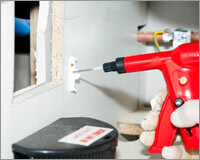 If requested by the customer we can carry out the proofing work on their behalf. 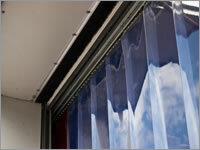 This might include the fitting of brush strip, rubber seals, PVC strip curtains, fly screens, filling of holes etc.